For many, Memorial Day marks the official beginning of summer. 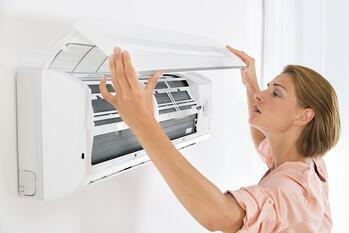 While you may be ready for the warmer temps after a long, cold winter, your house may not be. Here are some ways to prepare your home before the heat kicks into full gear. Run a test to make sure everything is working properly. Set your thermostat to cool and turn on the air conditioner. If it needs to be repaired, do it earlier in the season because as the temperature rises, so does the price and wait time for a repairman house call. While you’re at it, make sure the filters are clean and your thermostat is a programmable one. You can set these to use less AC during the day when no one is home, saving energy and potentially up to $100 a year. Your grill is a great way to keep the temperature in the house down because you’re not using your oven. A crockpot or indoor grills are also great alternatives if you don’t have an outdoor grill. This can help save a little money on the air conditioning side of things. Fans are a quick fix to add a little more air circulation into your home. On semi-warm days, you can use just the fan and on hot days, you can use the fan as a companion to your AC, decreasing the amount of power you need to use. Make sure the fan’s motor is set to run counter clockwise as this creates a wind-chill effect throughout the room. First, you'll want to make sure that your sprinklers actually turn on but this is also the time to make sure that every sprinkler is working properly and not leaking water. As you start mowing your lawn more, the chances of a broken sprinkler head become more likely and it’s a pretty easy fix that will save you money, water, and the color of your lawn. Just be careful that you don’t break the surrounding PVC pipe while digging, because that is a much more expensive fix. If you're looking to move in the near future, Cyprus Credit Union is your mortgage partner. Our team of highly specialized advisors will take a look at your financial situation, help you find the loan option that works best for you, and then be there to assist you every step of the way. For more information and our current rates, you can check out our website & mortgage center or call (801) 260-7999 and select option 3 to be transferred to a loan officer.